Imagine your designer asked you to implement a beautiful frame by frame animation for the awesome project you’ve been working on. As the front-end dev on the project, not only is it up to you to come up with a working animation, but also to deliver a silky smooth, performant and maintainable frame by frame animation that works great across different browsers, both on desktop and mobile. What Is a Frame by Frame Animation? … changes the contents of the Stage in every frame. It is best suited to complex animation in which an image changes in every frame instead of simply moving across the Stage. In other words, the subject of the animation is represented in a set of images. Each image in the set occupies an animation frame, and the rate of change with which each frame replaces the next produces the illusion of motion in the image. I will demonstrate the whole workflow as you’ll be working on this great blinking eye animation from Zeiss website. For this tutorial, I’ve chosen to use SVG images because they are great at scaling with different screen sizes for responsive web design. However, if for whatever reason you don’t want to use SVG graphics, you can create web animations with PNG, JPEG, and GIF image formats or use HTML5 Canvas. I will share my thoughts on these alternatives at the end of the article. For simplicity’s sake, in this tutorial you’ll be using the jQuery library and have Autoprefixer up and running, therefore the code will be free of browser-specific CSS prefixes. Now, let’s do some coding! The first option is straightforward enough, and that’s one reason why I like it. The next step is to replace the existing image with the next one over a period of time dynamically, so as to create the illusion of movement. The browser will stop the animation if users navigate to another tab. When the page loads, you call requestAnimationFrame for the first time and pass the step function to it, together with the animation’s startTime parameter built into the requestAnimationFrame function. At each step the code checks how much time has passed from the last image source update and, if it’s longer than the required time per frame, then it refreshes the image. Because you’re building an infinite animation, the code above checks if it’s got to the last frame and if so, it resets the frameNumber to 1; if not, it increases the frameNumber by 1. Images should have the same name structure made of an increasing number series and the same location (e.g., images/Eye-1.svg, images/Eye-2.svg, images/Eye-3.svg, etc.) so that the code can easily iterate through them. Finally, call requestAnimationFrame again to continue the whole process. It looks good. However, if you try this you’ll see it won’t work because when the animation starts, only the first image gets loaded. The reason for this is that the browser knows nothing about the images you want to display until the code updates the image element’s src attribute in the middle of the animation loop. For a smooth animation, you need to preload the images before the loop starts. There are different ways you can do this. Here’s the one I like best. It consists in appending hidden divs and setting their background-image property to point to the required images. See the Pen Frame by frame-animation-1-source by SitePoint (@SitePoint) on CodePen. Below I’ve listed some pros and cons to this approach. The animation can be janky on mobile devices. That’s because the browser has to perform a repaint each time the image element’s src attribute is updated (please check out Paul Lewis’ blog post for the details). The image is fixed in one place — no jumping back and forth is visible (you’ll see why this is important below). To avoid browser repaints, you could change the images’ opacity instead of changing their source. You could render all the images with opacity: 0 at page load and then set opacity: 1 for exactly when you want to show that frame. That would improve rendering performance, but you’ll still have to preload all the images up front (which could be tricky if you have other images on the page as well and don’t want to wait for all of them to load). Also, because of multiple images, you’ll still have a longer first-time page load duration. See the Pen Frame-by-frame-animation-2-opacity by SitePoint (@SitePoint) on CodePen. The usual workaround to prevent having to download multiple images consists in using an image sprite. Put all your images in one sprite by creating a line of frames that preserves the images’ order, i.e., the first image will be the leftmost and the last image will be the rightmost. Then, using CSS animations, move the sprite left to right frame by frame. The code above sets the background-size property depending on the number of frames — because there are 18 frames, it sets it to 1800%. The initial background-position is left so that at the beginning of the animation, the first image is shown. Then, with keyframes animation, the code gradually changes the position of the background to right over the time set in the animation-duration property (1.3s in the example above). The animation-timing-function property allows you to build a step by step animation which ensures users won’t see half of one frame and half of the following frame both at the same time. This introduction to CSS sprite sheet animation by Chris Mabry is a perfect explanation of how this approach works. See the Pen Frame-by-frame-animation-3-position by SitePoint (@SitePoint) on CodePen. Only one image to load, which is good for first-time page load performance. Same as previously, you’re now going to upgrade the solution implemented above in such a way as to avoid a browser repaint. You will do this by changing only the transform property of the element rather than its background-position. For this purpose, put the div you want to animate inside a wrapper. This enables you to translate the position of the whole HTML element instead of its background. Next, position this div absolutely inside the wrapper and start animating it with the help of the translateX property. The weird -94.44444444% comes from having 18 slides and moving the image only 17 slides from the first one (17 / 18 * 100%). It definitely looks better now! IE10 and IE11 on Windows 7 have a bug where translate transform values are always interpreted as pixels when used in animations. transform: translate3d(0, 0, 0) below tells the browser to move the element into a separate compositing layer, which improves rendering performance. See the Pen Frame-by-frame-animation-4-transform by SitePoint (@SitePoint) on CodePen. It doesn’t work in IE, though a fallback is available. No janky animation on mobile because no repaints are involved! One possible improvement would be inlining the SVG image (i.e., dumping the SVG code straight into your HTML page) instead of pointing to it as an external resource. Typically, external resources are cached by the browser. This way, on a repeated visit the browser uses the locally cached version of the file instead of making a new request to the server. However, if the probability of the page being revisited is low (say, a landing page), then it makes sense to use inline SVG, because doing so reduces the number of requests to the server and decreases the first-time page load time. 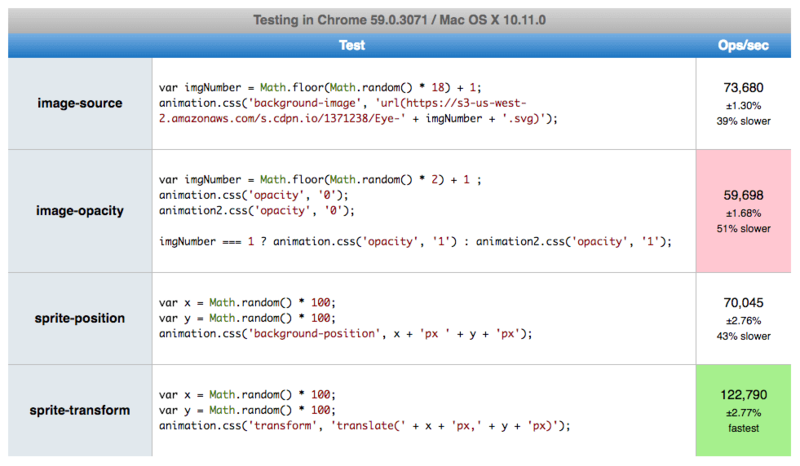 if you want to play with it, you can reproduce the tests using any other browser of your choice on jsPerf.com. 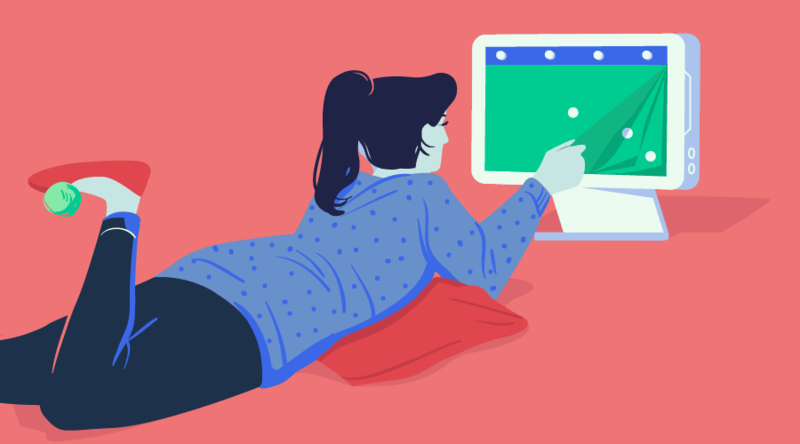 5 – Why Not GIF for Frame by Frame Animation on the Web? If the ability to scale with different screen sizes is not a requirement, then a GIF file could be an option too. But together with scalability, you’ll also lose the ability to control the animation flow like stop, reverse, or combine it with other animations. And you usually end up increasing the size of the asset, which affects performance. If you want to deep dive into the reasons why SVG is preferable to GIF, then check out Sara Soueidan’s excellent article on the topic. 6 – Why Not Canvas for Frame by Frame Animation? No support for DOM events — so, for example, you couldn’t do something with the DOM outside of the canvas element once the animation is finished. There are a few more arguments for and against Canvas over SVG, but if you decide to go with Canvas, then head over to William Malone’s tutorial on this topic, which does an outstanding job at explaining how you can achieve the best results. Use whatever solution you and your team feel comfortable with, if it keeps your code more readable and decreases maintenance costs inside the team. Which method do you go for to create your frame by frame web animations? Let me know in the comments. Front end fanatic and friend of all designers. Do magic at Buzzwoo.